Reversi (Othello) as it ought to be. both Windows and Mac OS X.
Click an image to view it full size. Othello is the 8x8 board standard variation of Reversi, and is included in the game. In addition 3D Reversi Deluxe supports playing on 7x7, 9x9 and 10x10 boards. To add extra depth, the Anti-Reversi game mode is also available for all board sizes. See the in-game help manual for more details. 3d Reversi Deluxe contains a huge range of personalized AI computer opponents. These players range in skill from beginner to expert, giving a challenge for all. Different AI players not only have different intelligence levels, but also have different playing styles. Using the Board Design menu, you can create boards easily and beautifully. Full board customization is possible, from customizable pictures and models, right up to the various lighting tints applied. Try it and you'll be surprised how easily you can create a spectacular 3d board to suit your taste. Play another human over the internet or over a network. Solid networking support includes saving and resuming of games in case of network disruption. Singles, League, Ladder, Two-Player and Multiplayer game modes, combined with the vast AI ranges, the different board sizes, and the Anti-Reversi game mode, all add up to give long lasting enjoyment and a unique gameplay experience. Replays - Save any game, and play back your famous victories in style. User Customization - add your picture to your player to give a personalized touch, and choose from a selection of piece layouts and play styles. Huge Range of Options - practically every aspect of the game can be modified: cameras, animations, colours, boards, sound, controls, etc. etc. You have full control over how things run in 3D Reversi Deluxe. To set up Multiplayer games, use the in-game GrassGames Multiplayer Connect system. If you do not find any opponents to play against, leave the game running in the background, and if someone goes online during this time, you will hear a repeated sound alerting you to this fact. 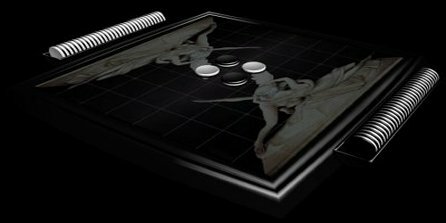 Click here to enter the 3D Reversi Deluxe Official Forum. the "Technical Problems" discussions you will see there.